Is the Spring Selling Season Finally Here? Existing home sales improved for the third time in the last five weeks according to the National Home Sales Snapshot released by DataQuick indicating that the beginning of the spring selling season may have finally arrived. There were 161,980 properties sold over the previous thirty-day rolling period ending March 27th, 1.6 percent above the previous week’s total of 159,455 sold properties but still 3.0 percent lower than the 166,980 properties sold four weeks ago. Sales volume was 40.0 percent below this year’s cycle peak of 269,817 sales which occurred during the 30-day rolling period prior to September 12th of last year. Last week’s home sales volume was 6.0 percent lower than the 172,353 homes sold during the same period a year ago but was still 13.2 percent higher than during the same period three years ago when 143,103 homes were sold. 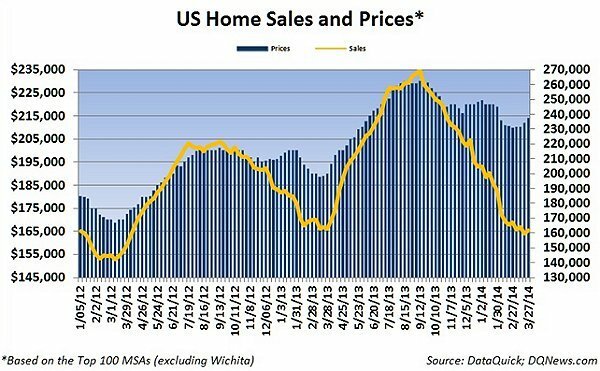 It was the 12th consecutive week that home sales have remained below the previous year’s levels. The median price of a home sold over the current thirty-day rolling period increased by $2,000 to $212,000 after increasing by the same amount the previous week. Four weeks ago the median home price was $209,900. Home prices were 12.6 percent higher than during the same period a year ago when the median price of a home was $190,000 and were 23.9 percent higher than the median price of $172,700 during the same period three years ago.